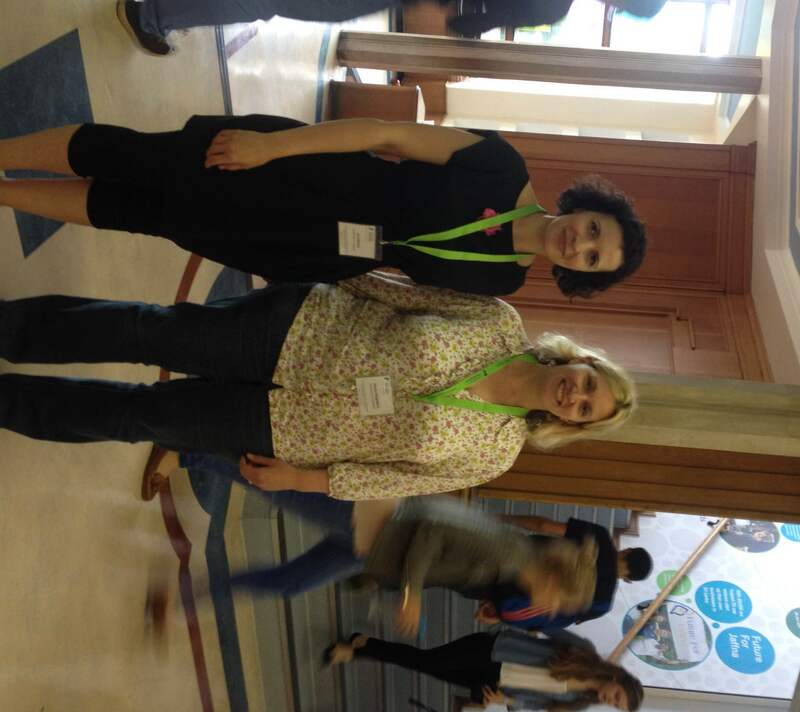 Two of our language lecturers, Ana Reimão, (in Portuguese) and Hanna Magedera (in German) attended the “Innoconf15” on ‘Innovative Language Teaching and Learning at University’ hosted by the University of Nottingham on 19 June 2015. The workshop started on the train in Sheffield when they were joined by four delegates from the University of Newcastle. Professor Zoltán Dörnyei (Nottingham) set the tone with his keynote on ‘Motivation and the Vision of Knowing a Second Language’ which was followed by papers on innovative teaching methods throughout the day and also practical sessions on teaching with the Sanako software led by company staff, before the closing keynote by Dr. Jan Hardman on ‘Engaging and motivating students (and yourself) through dialogic pedagogy’. Hanna Magedera also gave a well-received paper on “The fours skills news project as an example of communicative language learning for levels C1 and C2”, foregrounding digital learning and teaching skills, a project carried out with undergraduate German students. The conference was extremely well organised with postgraduate involvement and university catering providing an attractive and tasty near all-vegetarian lunch buffet. 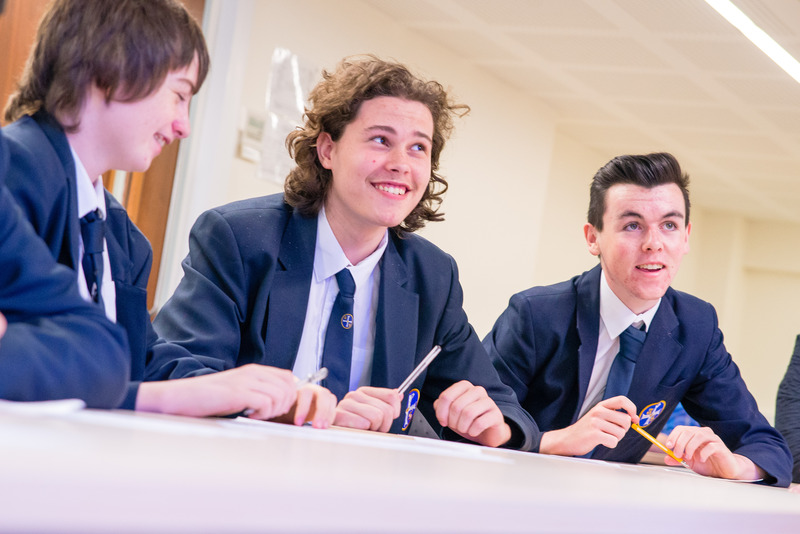 On Monday 22 June, over a hundred Year 10 pupils from five local schools took part in the HLC Summer Fair 2015. 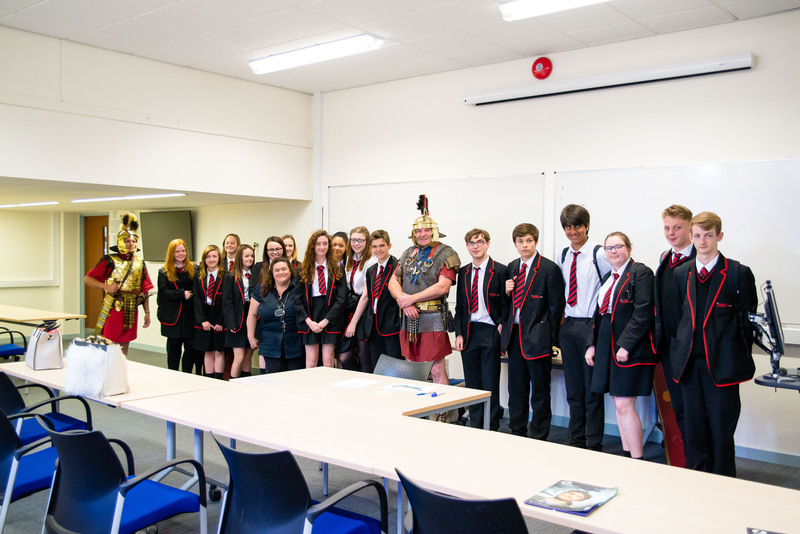 The event enabled GCSE pupils to sample taster sessions on a variety of subjects from across those taught within the School of Histories, Languages and Cultures. 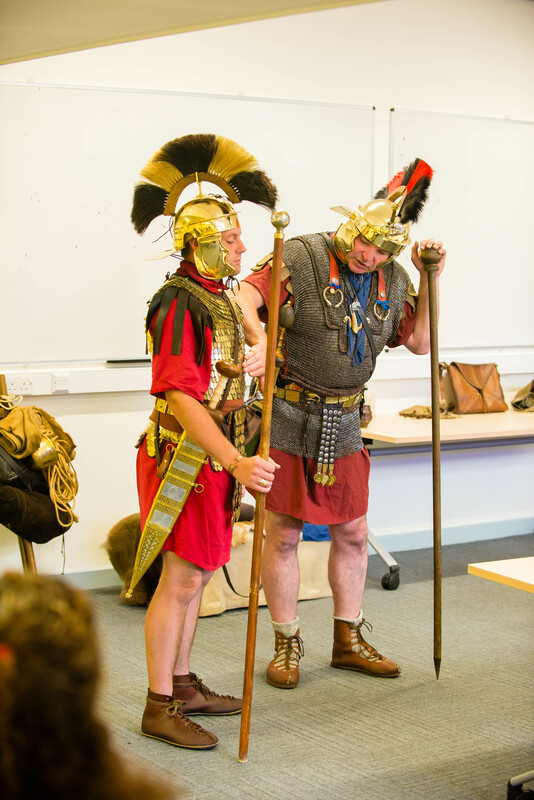 All the sessions were delivered by PhD students in HLC apart from a special guest appearance by two formidable but friendly Roman soldiers called Gary and Roland, who demonstrated their military skills to pupils courtesy of Roman Tours Ltd., Chester. 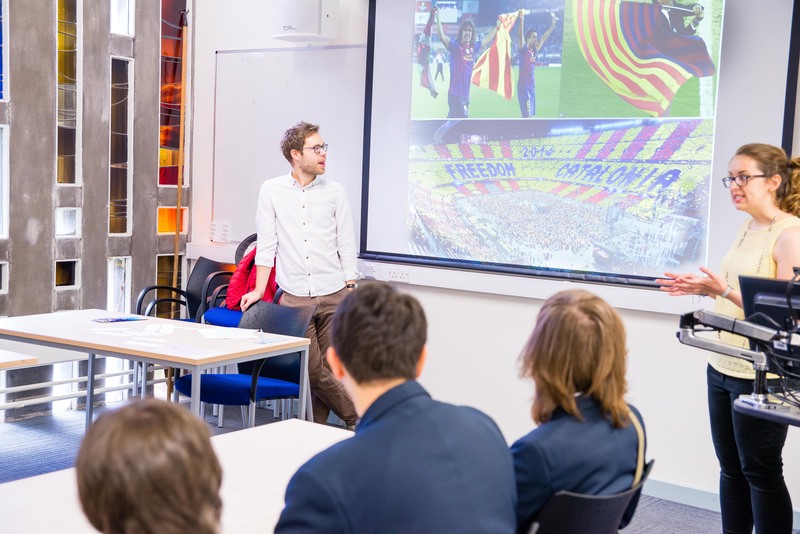 Given its success and growing popularity, the Summer Fair is set to become a regular event on the University of Liverpool campus, with an MLC Languages Fair also in the pipeline for next session. 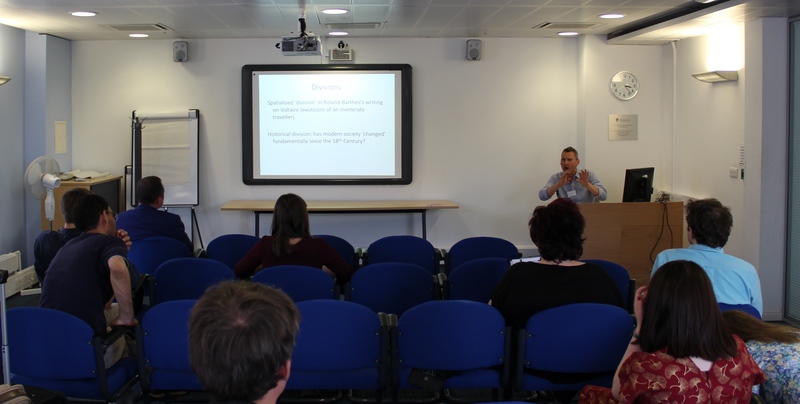 The Department of Modern Languages and Cultures hosted the fifth ASMCF Postgraduate workshop on 10 June 2015. 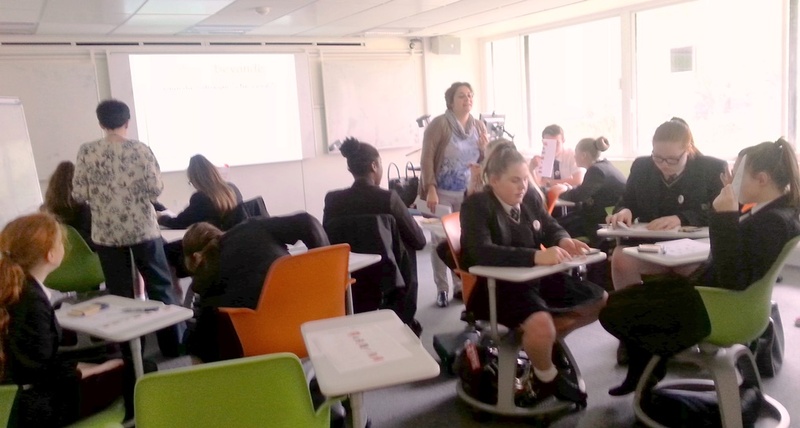 The North West group of the Association for the Study of Modern and Contemporary France organise this event on an annual basis, and draw together research students from across the north of England. The theme of this year’s workshop was ‘divisions’ in contemporary France and participants were invited in particular to consider the Charlie Hebdo massacres, most notably from the perspective of the rift they have driven (in France and elsewhere) between the ideal of free speech and the notion of censorship and restriction. Keynote speaker Dr Andy Stafford (University of Leeds) offered some bold and important reflections on the negative aspects of the Je Suis Charlie movement, drawing insightful parallels from the discussions of Roland Barthes on Voltaire. Beatrice Ivey (University of Leeds) scrutinised the particular performative nature of mourning, and the political nature of the global reaction (on social and mainstream media) to the killings. The theme of ‘divisions’ has a broad reach, and presentations from Mason Norton (Edge Hill University), Sophie Handler (University of Durham), and Will Amos and Hugh Hiscock (University of Liverpool) demonstrated how the term is relevant to a great deal of research on modern and contemporary France. Mason discussed the teaching of history in France today, questioning the extent to which it is subjected to entirely honest reflective practices; Hugh explored the contested sites of memory in the French south, and the role of this in constructing Maghrebian identities; Will’s presentation dealt with the battle for Corsican and Occitan linguistic rights, and the divisions these cause with French; and Sophie discussed the cultural otherworldliness of Proust’s ‘Magic Lantern’, and the differences conjured therein between ‘our’ world and the Oriental. Andy’s keynote, in particular, prompted a long and enlightening discussion about the possible problems of supporting Je Suis Charlie, a feeling which is gaining traction in various commentaries on the massacres in particular, and on contemporary France in general. The Latin(o) American Digital Art project, led by Claire Taylor and Jordana here in the department, is now gearing up for a new series of events under the Cities in Dialogue theme. The original Cities in Dialogue / Ciudades en Diálogo exhibition, which we reported about on this blog, first started out in Liverpool, UK in October 2014, and brought together four leading artists: Brian Mackern (Uruguay), Ricardo Miranda Zúñiga (US), Bárbara Palomino (Chile), and Marina Zerbarini (Argentina). The project are now taking the exhibition to South America! The first stop will be the historical Cabildo in Montevideo on Monday 8 June, where Claire and Jordana will participate in a round table with artist Brian Mackern, whilst also bringing into dialogue the work of new artists. You can see more details on the Roundtable Event Page. The project then moves to Buenos Aires on Wednesday 10 June where they will be running a panel on Digital Poetry and Digital Artefacts at the world-famous E-Poetry Festival. For more details on the panel, see the E-Poetry Panel Event Page. Then, on Thursday 11 June Claire and Jordana will be giving a workshop on digital art and curation at the UNA in the Escuela de Defensa Nacional. For more details on the workshop, see the Cities in Dialogue Workshop Page. If any of our soclas blog readers are based in Uruguay or Argentina, do pop along if you can! All of the events are free to attend, and there is no need to book, so you can go along to whichever event you like. If you can’t make the events in person, then you can join in the events on Twitter! Use your computer, mobile phone, tablet or other device to join in the discussion, and even influence the shape that an artwork will take. Follow @latamcyber, or view https://twitter.com/latamcyber to see the amazing images of a digital artwork in process throughout the week of 8-13 June. Using re-tweets, favourites, and the hashtag #citiesindialogue, you can comment on and vote for your favourite image. 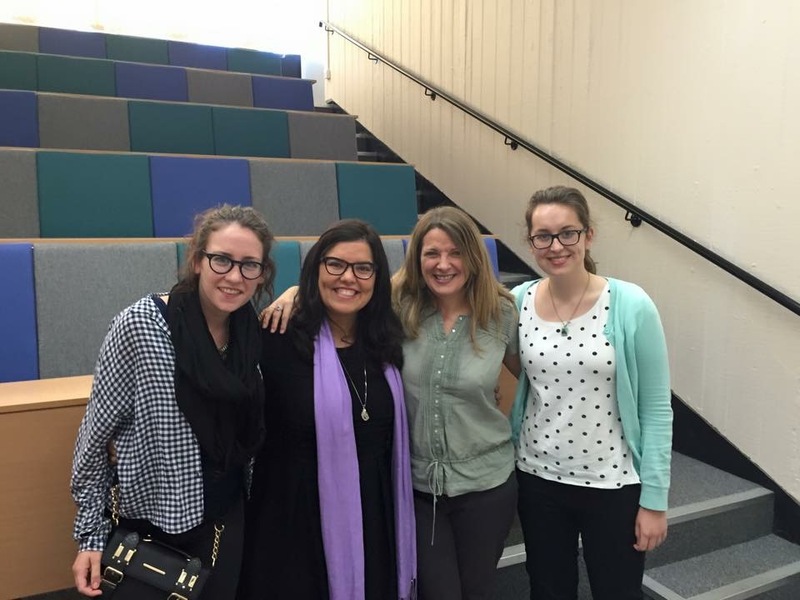 During May, our department welcomed Cris Lira, doctoral student from the University of Georgia, Athens, to Liverpool. 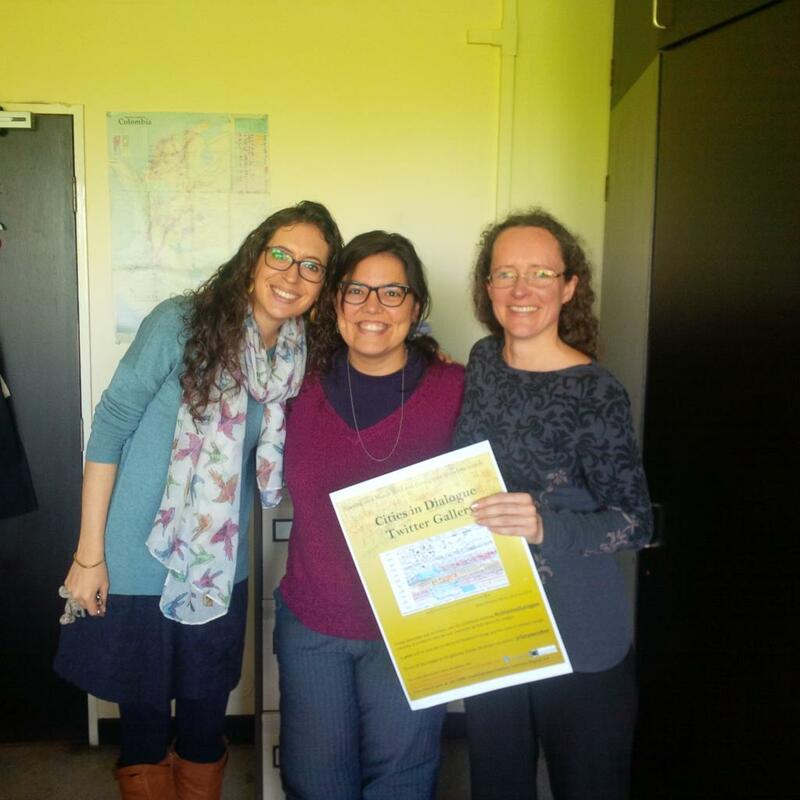 Cris was awarded the Franklin College-University of Liverpool Doctoral Research Fellowship, and came to Liverpool to pursue her research interests, working with Claire Taylor and other colleagues within the department. 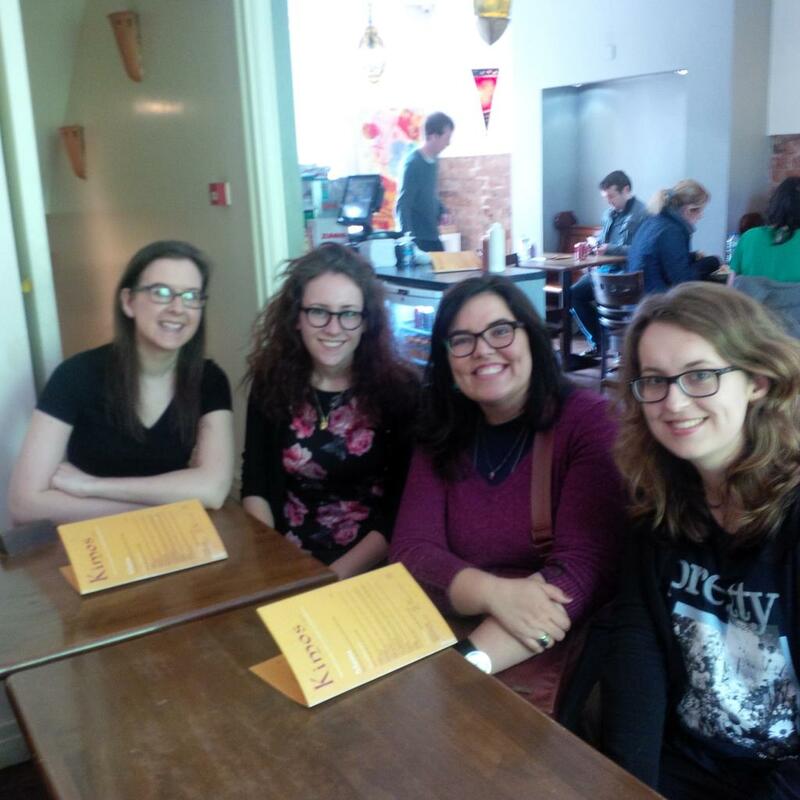 During a packed programme of activities, Cris met up with fellow doctoral studentsElizabeth Burgess, Jennifer Rodríguez and Ailsa Peate for a networking lunch to discuss her research, followed by a tour of Liverpool – visiting all the key sites, with thanks to Jennifer! Cris also took part in research discussions with Claire Taylor and Jordana Blejmar, in the context of her own research, and also learnt more about the Latin(o) American Digital Art Project, on which Claire and Jordana are currently working. 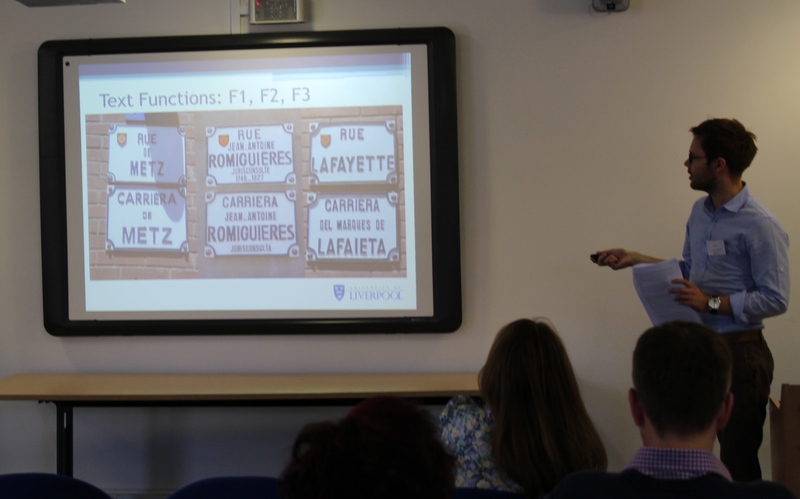 At mid-point during her visit, Cris spoke at the Departmental Research Seminar Series on Wednesday 13th May. 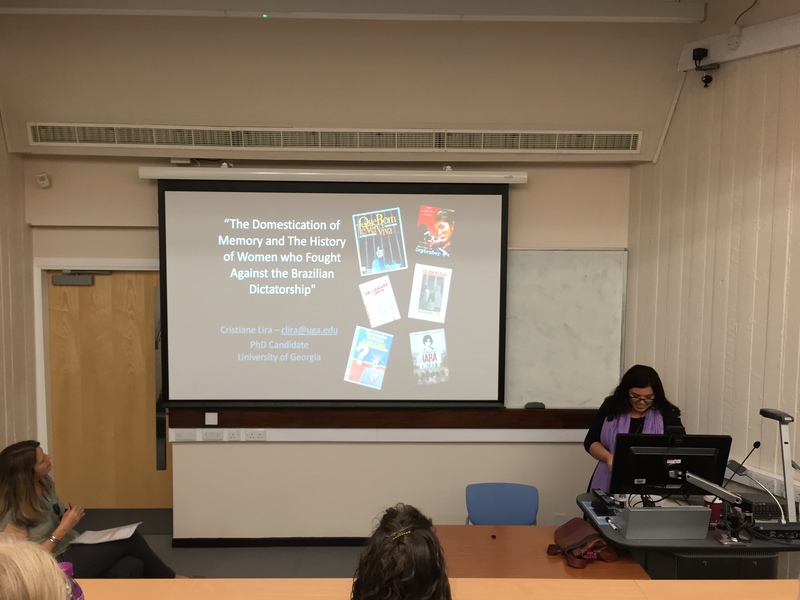 Entitled “The Domestication of Memory and The History of Women who Fought Against the Brazilian Dictatorship”, the talk drew on Cris’s doctoral research, with a particular focus on the testimonio. Cris also had the opportunity to visit the offices of the Bulletin of Hispanic Studies, where she gained an insight into how an academic journal works, and also helped out with the task of assigning book reviews.